To propose a project or become part of the Bramble Hill Farm community, please contact us here. A self-motivated learner will have the opportunity to work one on one as Hans Leo’s assistant for two to three months during the summer growing season. 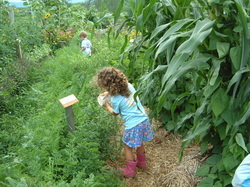 Most of the work will be in the farm’s education garden. All aspects of the growing cycle from seed to harvest will be covered. This educational opportunity would be especially valuable to anyone going to become a teacher. Other aspects of the work may entail but are not limited to fence maintenance, road repair, and firewood. The work is physically and mentally demanding. It is also spiritually rewarding. A final paper the subject of which will be determined during the course of the summer is required.